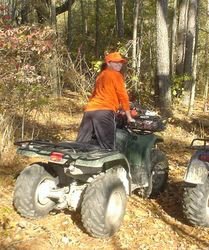 so even though i am not really good at "the outdoors" i am, in fact, a tomboy at heart so i had to get on the four wheeler and take it for a spin through the woods! Deer cabin was great. Seeing family is always wonderful. Going to a hotel both nights was EVEN better! karl didn't get any deer this weekend, but aparantly it was a record breaking opening day (as in lots of other people got deer!) two of the older guys at camp got bucks (a 10 point and and a 6 i believe) and karl's step-sister christy - her son garrett got a big doe. so karl is going back this weekend i think... to try his luck again. so i am a deer widow. gross. who invented that phrase and why did i just use it in a sentence? Adda girl! I'm swelling with pride at this very moment! I just have to say that you truely crack me up. Also, think it is so funny, just the way you are so cute about deer and hunting! I miss you!